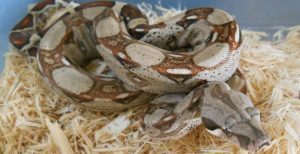 While once a rather common encounter it is actually a bit difficult to find pure Colombian boa constrictors anymore but a few dedicated breeders are still producing them. These particular Colombia Boa have a very distinct look compared to other boa constrictors imported from Colombia. They are very colorful and in my experience share some morphology and behavior with B. c. constrictor. Mine are pure Rio Bravo bloodline boa from his Barrnaquilla. 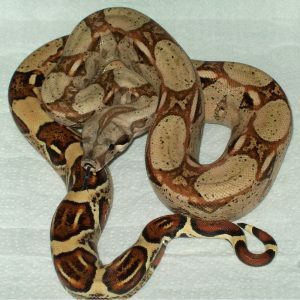 There has been so much mixing of various boa races by those producing boas for the morph market that the boa now on pet store shelves or on a vendor table at a herp expo labeled as a “common boa” or “normal red tail” often has little in common with the boa bearing that same title even a few years ago. While many “common boas” are almost bland, this is not the case with these boas from Colombia. These gems remind many including myself of earlier days in herpetoculture when outstanding imports with this look were imported fairly frequently. 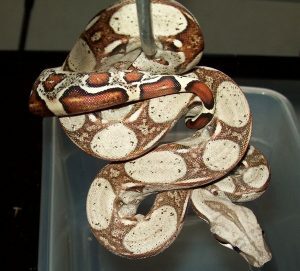 Similar boas with their subtle undertones were reportedly the founder stock for some “pastel” bloodlines within the hobby. These rival true red tails for their beauty and are typically calm boas that make good shoulder pets. These boas are a perfect first boa or even first pet snake. The young are often quite tame from day one. Some of the most beautiful boas in the world are produced from areas where naturally occuring subspecies intergradation occurs and that may be the case with these boas. The first two pictures below are of young boas that have a long way to go before they show their adult colors. These are boa that even those who aren’t fans of scaley creatures often find very attractive. These are pure Rio Bravo bloodline boa puchased directly from Gus Rentfro.